4 Benefits Of Having A Wireless Alarm System | Calgary Alarm Inc. Installing a home alarm system makes a lot of sense in a day and age that has no shortage of potential threats whether you live in the city, the suburbs or the country. That said, the cost of installation and monitoring can be a deterrent for some people. Fortunately, there are more modern alternatives to traditional alarm systems…and there are, quite literally, no strings attached. Wireless alarm systems are the way of the future. 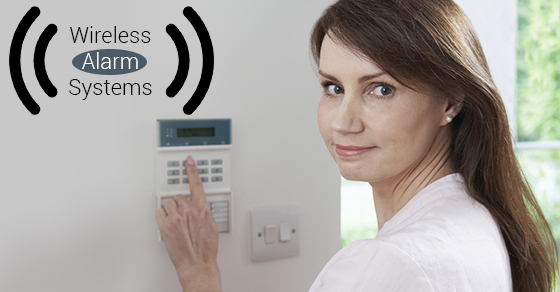 We’ve compiled a list of four top benefits of having a wireless alarm system in your home. If you currently have a traditional alarm system in place, the benefits covered below may be enough to get you seriously thinking about upgrading. Wireless alarm systems work by using radio waves and can therefore cover the square footage of your home with ease. Moreover, the motion detectors, such as those you would use to safeguard windows or doors, also use radio waves. Compared to traditional alarm systems, wireless alarm systems are fairly easy to install…and they’re also simple to configure to meet your specific needs. When it comes to wireless alarm systems, the wireless aspect means that you can use, for example, your smartphone to remotely control your system whether that involves arming it, disarming it, monitoring who comes and goes, and more. This greater degree of control means that you can easily keep tabs on your home in a way that simply would not be possible with a wired home security system. Installing a wireless alarm system is cheaper than installing a wired alarm system because the former, as opposed to the latter, does not require that you connect the system with the electrical wiring of your home, and you won’t require circuit tests in the way that you would if you install a wired alarm system. Because you won’t have to drill through your walls to do the installation, your wireless alarm system will be more aesthetically pleasing and not at all an eyesore. If you have any questions about the benefits of installing a wireless alarm system, we can help. Get in touch to learn more about how our products and services can help protect you, your family and your home.